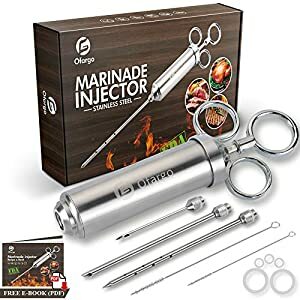 Are you still frustrating for the dry and flavorless food when BBQ’d steak, grilled chicken, roast turkey? 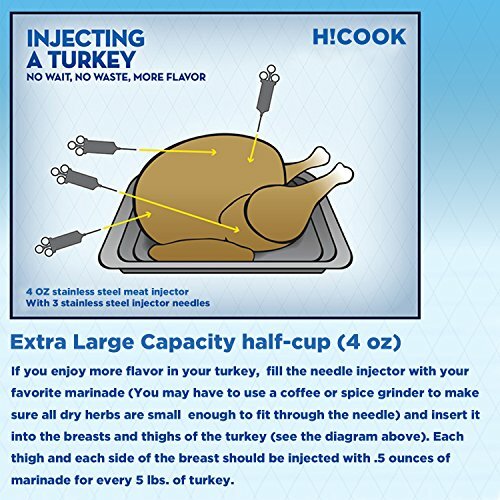 HICOOK‘s 4 oz meat injector ensures you never have to settle for dry or bland food. Nor do you have to wait hours for little more than surface flavoring. 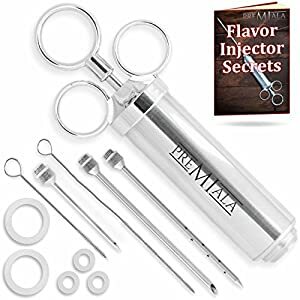 With a practical and functional design, the Beast Injector penetrates deep to deliver optimum flavor infusion throughout. 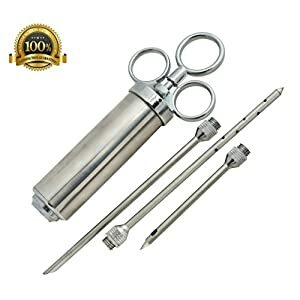 Made from HIGH GRADE STAINLESS STEEL – HICOOK’s meat injector is perfect for intensifying the flavor of brisket, pork, chicken, turkey, lamb, goose, duck, and more! 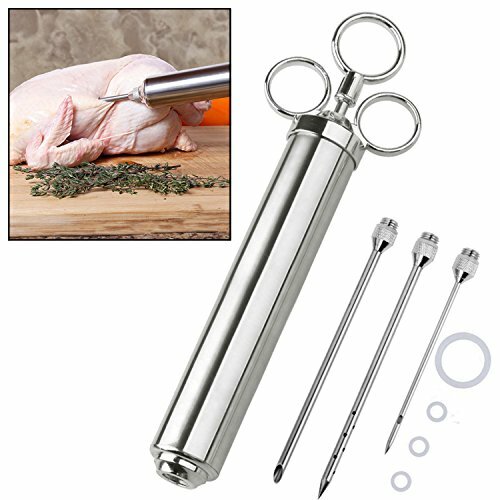 Durable and sharp, the needles puncture any meat or poultry with ease, ensuring you can enrich the taste of tough or thick cuts. 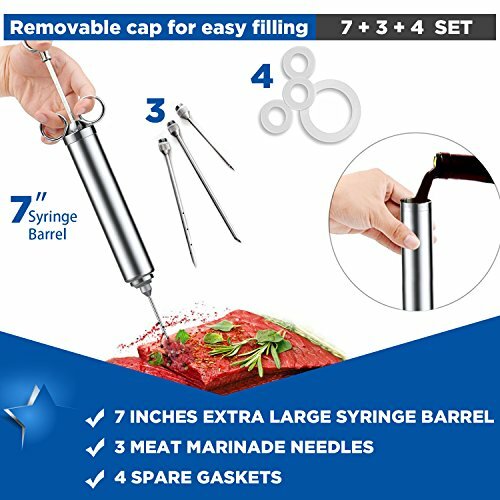 A 4-OUNCE (1/2 CUP) EXTRA LARGE BARREL – minimizes refills, a sturdy marinade injector plunger offers improved pressure control, and a three-ring handle gives you a better grip for optimum comfort. 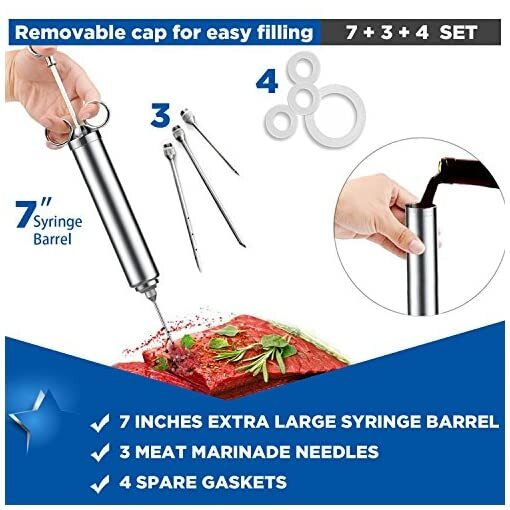 Super quick and easy to disassemble, this premium quality meat marinade injector is also dishwasher-safe, making cleanup a piece of cake! 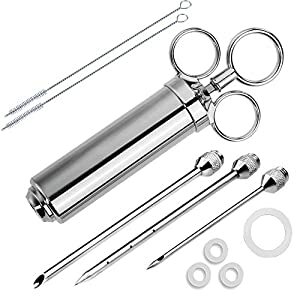 SPECIALLY DESIGN NEEDLES SET – allows for deep penetration and even distribution so every bite contains an explosion of flavor. 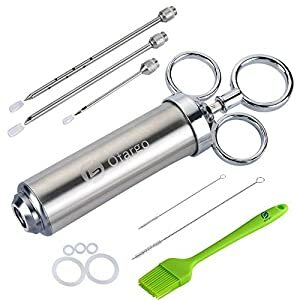 Includes three additional needles: 6″ Liquids injector with side holes & solids injector with large end hole & 3″ needle is for a more precision injection and for smaller cuts of meat. 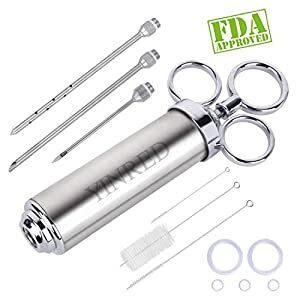 NO MORE CHEWY AND BLAND MEAT – with HICOOK perfectly crafted meat injector kit every bite of the meat is flavorful and juicy. 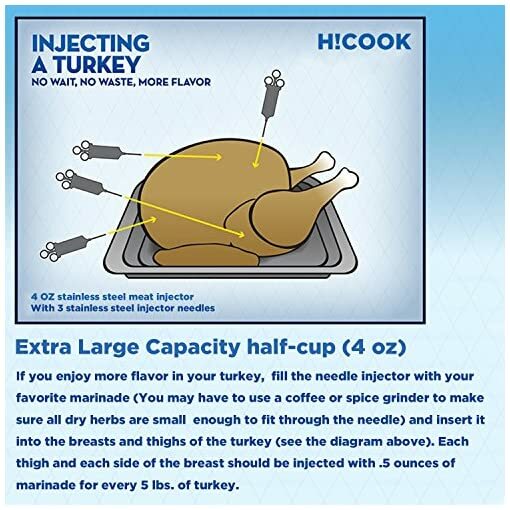 Use it to marinade softer meats like chicken or turkey or use it to marinade lamb or steak. 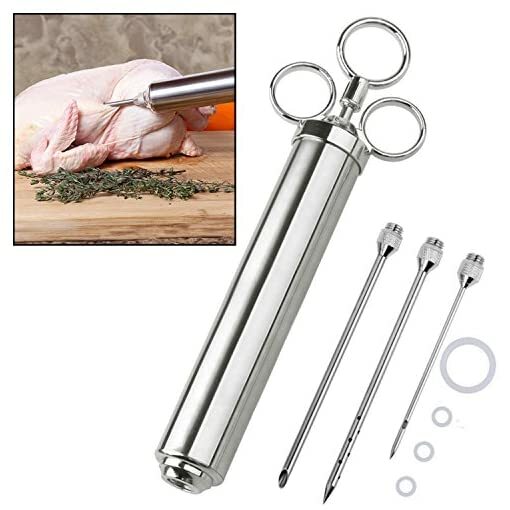 Its durable design ensures that you get the same flavorful taste on any meat you love. 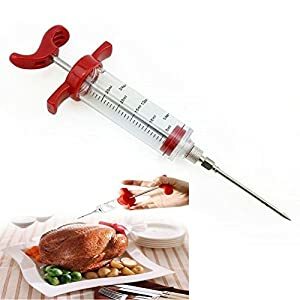 Easy to Clean – super quick and easy to disassemble, making clean up a little bit easier, this premium quality meat injector syringe is also dishwasher-safe.